Balustrades form an important part of most homes in Brisbane; in fact, there are laws in Queensland specifying that all homes require balustrades where there is a drop of one metre or more. Unfortunately, not all balustrades offer sleek, elegant designs or durable, robust quality and this can leave many homeowners with limited options. At Dean Wilson Iron we have a solution for this problem: handcrafted wrought iron balustrades. Wrought iron is ideal for balustrades for many reasons. Balustrades serve an important purpose and for this reason, they must be strong and durable. Wrought iron offers unrivalled strength and durability, which ensures that your balustrade will guarantee your safety and the safety of those around you. Further to this, wrought iron is ductile and malleable which allows it to be crafted into intricate designs that will greatly enhance the aesthetic of your balcony, staircase, or any other feature of your home. At Dean Wilson Iron, we handcraft all of our wrought iron balustrades with one clear priority: to create a product that is unrivalled in design, functionality and practicality. We have a wealth of experience working with wrought iron and this allows us to constantly strive for the most innovative and high-quality designs in Brisbane. We seek to combine practicality with design so that you get the benefits of functionality and unmatched aesthetic appeal, whilst still complying with the relevant laws and regulations. The team here at Dean Wilson Iron understand that each of our clients’ needs will be different – different homes, different balustrading requirements and different personal styles all contribute to the need for a unique product and delivering distinguished and unique products is our speciality. We work in close consultation with our clients to establish their exact needs before commencing on the manufacture of the product itself. No job is too big or too small; we can cater for everyone’s needs whether you require a sleek and elegant indoor balustrade, a grand and stately outdoor balustrade or anything in between. Balustrades can have a considerable impact on the appearance of your home; internal balustrades can draw attention from guests and residents alike, whilst balustrades outside your home can often be seen from beyond your property. For this reason, it is important that you choose the right balustrade and that is where the team at Dean Wilson Iron can help. Our aim is simple: to deliver stunning, durable and practical balustrades that meet Australian standards. We understand that all homeowners are legally required to install balustrades in certain circumstances and we do not feel that this should limit you; rather we see it as an opportunity for you to showcase the design of your home with a unique and elegant balustrade that was created on your terms to complement the features of your house. We use wrought iron in all of our balustrades, because it offers a range of advantages that are second to no other material. Firstly, wrought iron is very malleable – it can be shaped and crafted into intricate and stunning designs that are sure to be the focal point of any home. Secondly, it is very strong – wrought iron can withstand immense pressure and this makes it perfect for use as balustrading. You can rest assured that a wrought iron balustrade will protect your safety, no matter what the conditions. Finally, wrought iron is very durable and can be installed inside or outside. 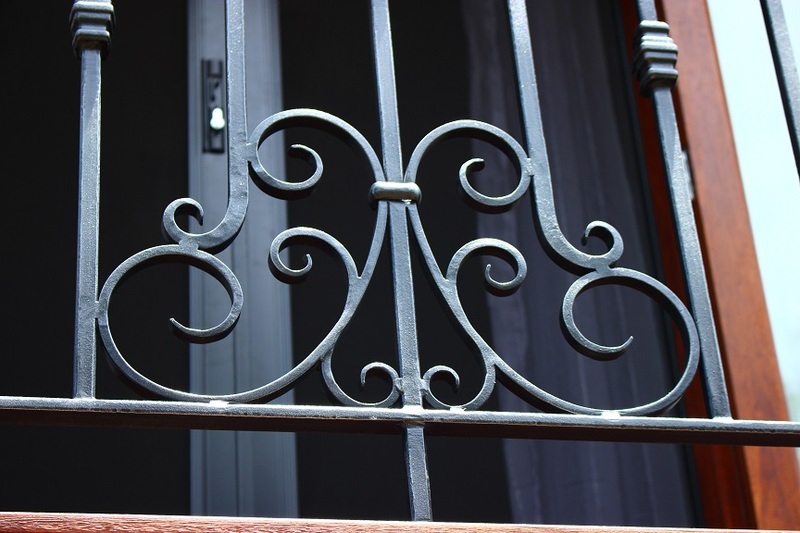 We finish all of our wrought iron to ensure that it will resist the harsh Brisbane climate without rusting or corroding, to give you many years of immaculate balustrades. Service – our team is dedicated to catering for your requirements. Design – we will work with you to develop a unique, customised balustrade. Quality – we complete all of our work to an unrivalled standard of quality. Installation – we will expertly install your wrought iron balustrade to ensure strength and longevity. At Dean Wilson Iron, our work is centred on you. 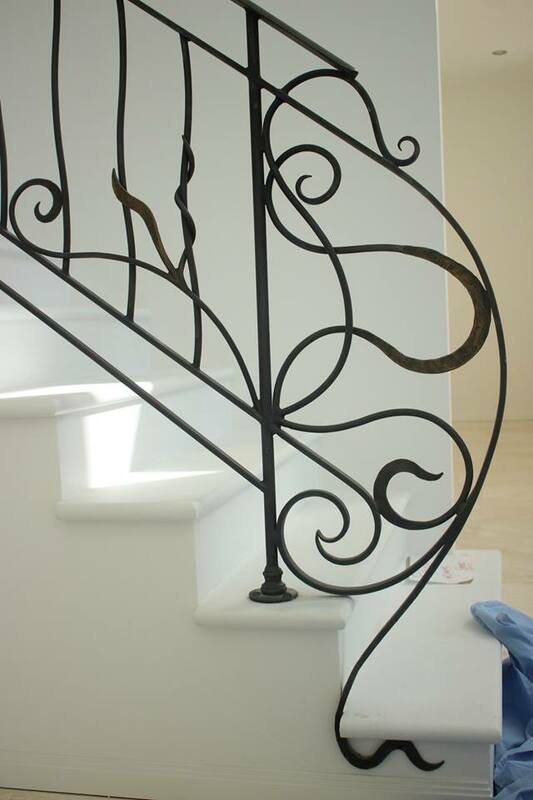 To make sure that you receive the perfect balustrading, we take a number of measures to meet your exact needs and produced personalised and unique wrought iron creations. Our team recognises that you want balustrades that reflect the design features of your home, as well as your lifestyle and to ensure that your unique balustrade complements both of these things we have developed an industry leading build process. Our process begins with a consultation to discuss your requirements and explore any possible design concepts you may have. Our foremost priority is to create a unique wrought iron balustrade that is customised to your specifications and to do this effectively we need to ascertain precisely what you are looking for. Our initial consultation is also an ideal time in which to present us with any queries you may have, or seek clarification on any points of confusion. Once we have established some idea of your design concept and worked out some basic measurements for the area of installation, we can provide you with a quote. We accept that you do not want to be kept waiting, so we aim to deliver your quote as soon as possible. Based on nothing more that some rough measurements and design information, we can provide you with an instant quote so you will have plenty of time to consider your options. Following the first two steps, we can commence work on your balustrades. Using the details that you provided us with during the consultation, we will work to bring your vision to life with our wealth of knowledge and expertise. To ensure that everything is done in accordance with your specifications, we will keep you updated. Our team can provide you with photos of the balustrading at various stages of completion and you are welcome to come in and inspect it for yourself, if that is convenient for you. Once your balustrade has been completed to your satisfaction, it will be ready for installation. Our wrought iron experts are skilled not only at creating wrought iron balustrades, but also at installing them. We are well positioned to install the balustrading in line with Australian regulations and in a manner that complements its quality and design appeal. You can rest assured that the installation of your wrought iron balustrade will be impeccable, ensuring a stunning and elegant finish. If you need balustrades but are not willing to settle for anything short of the best, then contact us today. 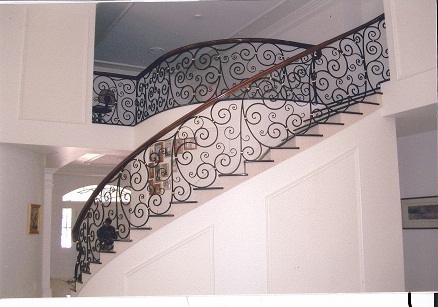 Our wrought iron balustrades combine quality, safety and design to create the most unique balustrades in Brisbane. Alternatively, if you have any queries or would like to see evidence of our work across Southeast Queensland, then we can be found on Facebook. #1 Are all of your wrought iron balustrades rust resistant? Here at Dean Wilson Iron, we strive to create only the highest quality wrought iron balustrades. To ensure that you are getting the most durable product, we sandblast our wrought iron, before applying a layer of corrosion resistant zinc and a decorative powder coat or hand-rubbed natural iron finish. The result of this is flawlessly finished rust resistant balustrading that will last you for many years to come. #2 I am interested in wrought iron balustrades but I don’t know where to start? The team here at Dean Wilson Iron will happily guide you through the process and address any queries you may have about wrought iron balustrades. We work together with you to establish the perfect design that reflects both your requirements and the design features of your home. You can contact our team today with any questions – we will happily run you through our products and service. #3 How long does it take for you to manufacture customised wrought iron balustrades? We handcraft every one of our products and because of this, it is best to allow as much time as possible to ensure that every detail is accounted for. Normally, it takes us six to eight weeks and because of this, we suggest that you contact us while you are still designing your house or renovation. #4 Do you provide any guarantees with your wrought iron balustrades? We guarantee all of our wrought iron products for ten years against manufacture, installation and rust. We are committed to bringing you the most durable and high quality wrought iron products in Brisbane and we see our guarantee as evidence of our products’ quality and workmanship.